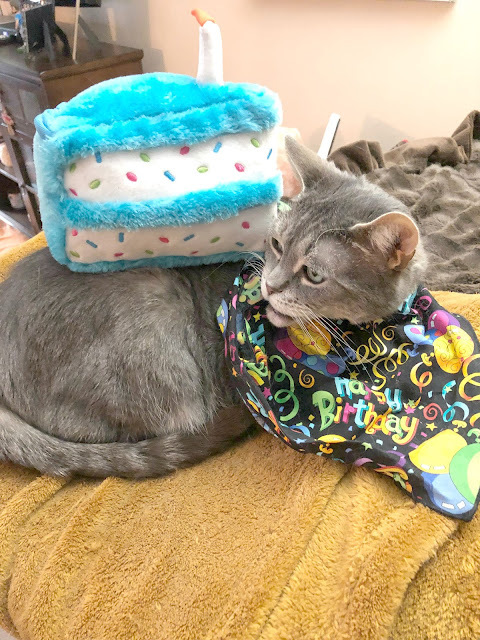 Cat Chat With Caren And Cody: Happy 15th Birthday Petfinder! Help Petfinder.com get 15,000 pets adopted this weekend!! Happy 15th Birthday Petfinder! Help Petfinder.com get 15,000 pets adopted this weekend!! Cody and I are honored to devote our Blog The Change blog post to helping Petfinder get 15,000 pets adopted this weekend!! "Pet finder is the virtual home of 358,825 adoptable pets from 13,534 adoption groups"
Adopting a pet that needs a home is one of the most rewarding gifts you can give yourself, as well as the precious furry one. I adopted Cody on July 28th, 2007 and there isn't a day that goes by that his snuggles, nose taps, purrs, kitty kisses and clownish ways don't fill my heart with a love that only an animal can evoke. He helped to heal me. I had lost my beloved Bobo July 2nd, 2007 and could no longer bear to live my life without the love and comfort of a cat. Our pets love us unconditionally. They don't care how much money we have, how talented we are, where we live or what we look like. They just want to love US, warts and all. All living creatures are gifts from God. They deserve to live a life brimming with security and love. Animals cannot speak for themselves, so it is up to us, to utilize to our fullest ability, the gift of speech that we have been given (and our opposable thumbs) to speak for them. It is our responsiblity to love them. It is our responsiblity to help them. With all that these precious babies bring to OUR lives, it is the least we can do for THEM. Won't you open your home and heart to a new addition? "Callie is one of a kind! 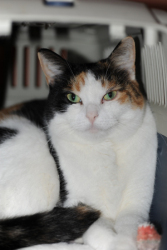 She is a large Calico, yes, she has a bit of a tummy and she would hate me for talking about her weight. She hopes to one day be a dainty slim gal, so in her new home, she would like to go on a bit of a diet. She likes to play and goof around with other kitties. Callie is a great girl with a very sweet personality. She is going to fit in very quickly into a new loving home!" 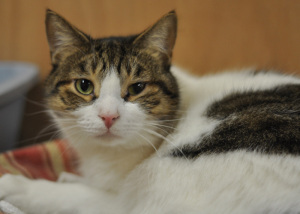 "Spooky is a tenderhearted, sweetie pie 2-3 year old male Tabby. He is a golden boy! Spooky loves other kitties and will do great in a home with a buddy cat to play and have fun with. He is a true blue companion who will brighten all of your days!" "Gorgeous! 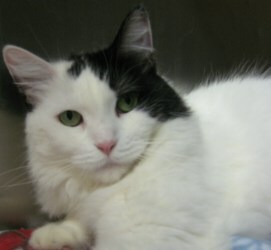 Zelda is a female long hair white & black adult cat. She is so sweet, but is still learning to trust people. She is currently in foster care learning how to live like a normal lucky house cat! :) She is just a bit timid. 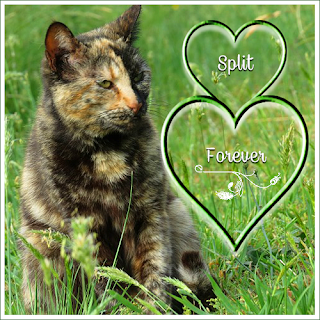 She would do best in a home that she can stretch out and feel safe & comfortable. She does very well with other kitties and lives with a few right now. " "Check out our handsome boy Rusty! 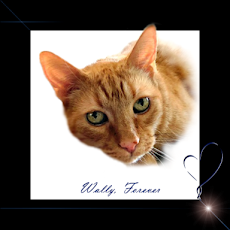 He is an adult male, short hair orange tabby. Rusty was found living in an abandoned apartment. He hadn't eaten or drank anything in days. Needless to say, when Rusty finally made it to the shelter, he quickly devoured a full bowl of food and lapped up an entire bowl of water and immediately asked for more. Rusty truly is a very spunky guy, and one thing neat about him is that he is polydactyl, which means he has an extra toe on each of his front paws. It looks like he's wearing mittens! He is full of silly personality and is going to keep his new family forever entertained! Rusty is not one of those scaredy-cats, he likes to be in the middle of the action! If you are looking for a cat who "acts like a dog", then you have met your match! :) Rusty deserves a wonderful forever home where he will always feel love and kindness, where he will never again know hunger, thirst, and loneliness. 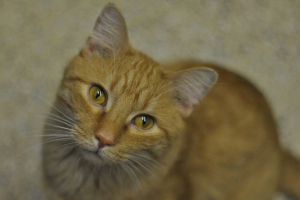 If you would like to give Rusty all the love he deserves, please come to the shelter to meet him. He's waiting patiently for you." HOT OFF THE PRESS! BREAKING NEWS!! Cody and I are THRILLED to announce that we are the lucky WINNERS of the Royal Canin/Petco "GOGO" promotion that Romeo the Cat featured on his blog! (See the original post here) We won $1000 which is being mailed directly to ALMOST HOME, that is where the kitties above are living until they find their furever home! You can read all about the contest winners on Romeo's blog right here. Cody and I have a particular fondness for both Royal Canin and Petco. Cody eats Royal Canin's food and Cody was adopted from a rescue that was at a Petco that used to be near our home, on July 28th, 2007. We are thrilled and PROUD to be able to give back! Great post Caren! Here's to hoping that Petfinder reaches their amazing goal!! We love Petfinder in Malaysia too. We've got a new kitten. An ex stray. Come and see? I absolutely love petfinder! I've posted rescues there, and have gotten rescues from their posts. Glad you reminded us, and I sure hope they reach their goal! Great post! We are purring for all our fluffy and furry furiends to find furever homes. Happy birthday to Petfinder! I hope they FAR SURPASS their 15,000 adoption goal! Fingers crossed that they reach their goal!! Wow, 15 years is terrific. And wouldn't it be fantastic if they reach their goal? Concats on your wonderful win! Scott and I could not imagine life without our Horde...their love and antics keep us laughing every day. Concats on the win of the contest! @Pup Fan "great minds!!!" 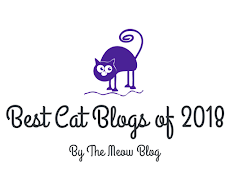 I will be reading the blogs this evening so I will be sure to check yours out! Going to be out most of the afternoon but I will check tonight for sure! THANK YOU!! @Katnip Lounge THANK YOU! We were just BEYOND thrilled! You are blessed to have all of your babies for sure! @Abby THANK YOU SO MUCH! We are thrilled! Thanks everyone! Petfinder does such amazing work, happy to be helping them! I hope these 4 sweet kitties find their forever homes. 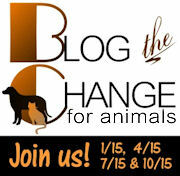 How wonderful you are Blogging the Change for Petfinder! And congrats on winning the promotion! The money will help so many kitties that need a home. Good luck Petfinder with your goal!!! We got lots of great information from Petfinder when we were looking for a breed rescue. This is wonderful. I love Petfinder! It was because of their Adopt the Internet day on March 15th, as I was writing a blog about it, that I discovered a cute little guinea pig at my local shelter. Brought her home to join my other 3...but lo and behold - 2 months later - ANOTHER popped out on Mother's Day! LOL! So now I have 5! Congorats on your big win! That is awesome. Their is no substitute on earth for the love of an animal. 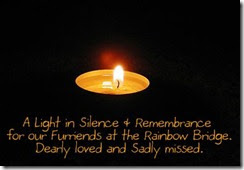 Wonderful post, Caren! I'm so touched by your story of Cody's adoption and the loss of Bobo, I can really relate. Happy Birthday to Petfinder, here's to many more amazing years of that great site. Congrats the GoGo victory, how fabulous!!! 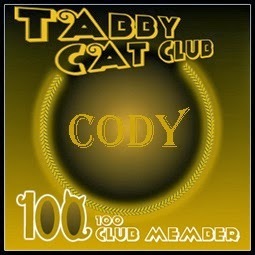 Yay to you and Cody! Great post! I'm another who mentioned Pet Finder for BtC4A today - it's a great resource to help folks match up with their next companion. Caren you are SUCH a kind soul! What a lovely post on behalf of all those animals that needs us SO much (and we desperately need them!). Imagine if each person on Prozac adopted a cat instead - they'd recover in no time (I seriously believe it!). I can't believe how beautiful they all are. Oh, and what a terrific way to pass on your win - love it so much. @Ann nooo I'm not wonderful but thank you!!! Petfinder is! I sure am hoping these babies can find their furever home! @Gods Little People, YOU are the KINDEST soul w/all of the ferals you help on a daily basis? YOU are helping them first hand, feeding them, giving them shelter, taking them to the vet and nursing them back to health, loving them. YOU amaze ME! I love your idea of everyone who is on Prozac adopting a kitty, I wish that could be that easy! Actually the win was FOR a rescue!! That was the contest stipulation, I am THRILLED for Almost Home! @Jen K I hope to get over to read your blog as well! Thanks for helping Petfinder too! @Julie, awwww THANK YOU!!! That was soooo sweet!!! @Julia, thank you and soooo true! @Art and Sew Forth, you know I remember you mentioning that you adopted a guinea pig as a result of helping petfinder. How cool is THAT???? I also think it is so neat that on Mother's Day they presented you with another baby to love!!!! Guinea Pigs are adorable, I just love them! Great!!! Hey' y'all are a good looking bunch! Cody, we thinks you should send your Mommy to adopt "Zelda", she looks just like Arty Mouse and she sounds like Arty when she first came to live with us. How can you resist having her for your very own live in girlfriend? We are a big fan of Petfinder, they helped us find Fenris. Congrats on wining the GOGO promotion. @Artemisia, sadly we have to resist. We live in a condo and we are only permitted to have two pets. If we had a house with a huge yard I would probably adopt every kitty that I would see. That is the hardest part. I would want them all. I am so happy that Zelda resembles and is like your Arty, maybe that means that Zelda will have a wonderful "furever" home too. Wow you found Fenris on Petfinder? He is an amazing dog! Thanks go much for the congratulations too! Such sweet kitties. I hope they were able to find a home. Congrats Caren...and Cody! You both deserve it so much! Congratulations on winning the $1000 for Almost Home! What a wonderful endorsement for Petfinder. They certainly do provide a great service. Congrats on the win! I'm sure that Almost Home is most grateful for your generosity. Wow, this made my day. Huge congrats. I'm thrilled the pet blogosphere is rallying for Petfinders this weekend. I'd like to add; if adoption isn't an option , please look into fostering. That's what we did last week. We have two little kitten furriends in Alabama that will be up for adoption this weekend. We hope they get a forever together home..together! @Michelle THANK YOU!! It isn't me that deserves it! It is Almost Home that does! She returned my email today and she is beyond excited, I am just thrilled for them! @Cats Goats Quotes I hope your kitten friends get adopted real soon! Happy Weekend to you too! @Cat Wisdom 101 awww THANK YOU! YOU made MY day!! THANK YOU! I agree that fostering is a wonderful option. I wish I could. I can't for 2 reasons, the first being that we are in a condo and are only permitted to have 2 pets (we already have two), the other reason is, I am the type that grows so attached I could never give them up. I always tell my husband if I ever win the lottery I am opening a no kill shelter with acreage like Caboodle Ranch, etc lol. I saw your newest foster who is ADORABLE! I read I just didn't leave a comment because I was in a hurry to go to Weight Watcher's this morning. Your baby is precious! Ohhhh and I know I would fall completely in love with your farmhouse, I think you said antique farmhouse? It looks sooo warm and inviting! @Pat thank you sooooo much! We are so happy to donate to them. They are right in our neighborhood and the mother and daughter team have been rescuing for YEARS. I am just so happy for them! @Ingrid THANK YOU SOOOOOOO MUCH! We are sooo happy! Happy birthday to Petfinder!!! Their website helped us to find our Niko. We hope many many more animals will find forever homes. Great post & congratulations on winning for your shelter! @Richa thank you so much! I will stop over and visit you guys right now! @Tamago awww that is wonderful that their website helped you find Niko! We hope they find their furever homes too! @Oskar thank you soooo much! We were so excited! They are located super close to where we live! Congratulations! This is for such a good cause too. We want to thank you for you kind thoughts that Cookie recover his sight - we are still hopeful this will happen. Congrats to you both for winning these $ 1,000.00 for such a nobel cause!!! Oh, we have had two felines adopted from the Humane Society and I swear that they KNOW you rescued them and reward you with a love that is incredible. Have a wonderful Sunday and keep up this great work. Petfinder is a wonderful site that brings adoptable pets and people looking for a pet together. I'm just always overwhelmed at the sheer number of pets listed there in need of a good home. @Admiral Hestorb, well...SURPRISE!!! it is HERE! We would also like to adopt all the homeless pets. We are purring that they all find wonderful homes. We just know "Zelda" is going to find a great home where she can rule the roost. Tsarina Zelda has a nice ring to it. Thanks for your encouraging words of support, I too, hope my sight comes back very soon!